Is it creepy that my boyfriend is like L? No kidding, he loves his baggy blue jeans, always wears loose white t-shirts, has black eyes and dark black hair, dosen't wear shoes indoors, spends hours in his room studying cases (he wants to be a lawyer), sits in a wierd way, treats me like a princess. And he dosent know who L is! nope! you're lucky though. 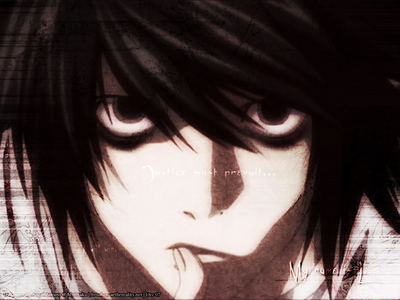 anyone would die to meet someone like L. Does he like sweets? .___. Hell yes, and he dosen't even have dental problems. I eat one Schokolade and worry about gaining five pounds but not him! Your Kidding??? Du should be the happiest girl in the world! I would Liebe it if my boyfriend would be like L! That would be the Coolest thing in the world! Maybe....he solves Sudoku's in like seconds! Weird in a good way! I mean, that's almost creepy closeness. But, then again, who (at least Death Note fans) wouldn't want to datum L? Du ARE THE LUCKIEST GIRL IN THE UNIVERSE BE HAPPY Du FOUND SOMEONE LIKE L! THE CHANCES OF SOMEONE BEING THAT SIMALAR TO L IS 1 IN A GIZILLION! IT'S NOT AT ALL CREEPY IT'S A MIRACLE!! Enjoy it, sadly I have a friend who is just like Kira and BB put together and has no clue who they are.